My wooden basket became too small for the amount of poppies I have knitted so far and I had to transfer my colorful pretties to a glass bowl. 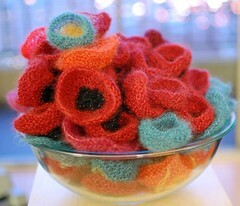 I have knitted 80 poppies so far, only 20 more to go. My glass bowl can hardly contain this abundance of goodness and is about to overflow. I simply love it! Knitting the poppies for my Poppies of Endearment project has been easy. The challenging part is yet to come. After I have knitted a 100 poppies, I will cluster 3 poppies together, attach an affirmation/saying/poem, place them somewhere in San Francisco, take a picture and leave them behind. Sounds easy…but to me it is challenging on several levels! Place them somewhere in San Francisco. Yikes, this city is big…and I just dipped my toe in it. Oh well, it will force me to go out there, and find good spots, preferably photogenic ones, to leave the poppies behind. Take a picture. A good opportunity to get more and more comfortable with my DSLR camera and my latest Nikkor 35mm f/1.8 lens. Leave the poppies behind for a stranger to find. Detaching from an item you spend much time on… to be gifted to a total stranger. And lastly, document everything on the blog. Hands down the most interesting knitting adventure I have ever embarked on! Hey Nancy, you keep on going on about your poppies, but how about your website? Ha! I wondered when you would ask! Me and web developer Andy Bottman have been going back and forth over the past few weeks and I just received message that he is ready to do a final import to my new website. Don’t ask me for details, I am ignorant on how these things work. I will let you know here on this blog, when the other one is up and running so you all can head that way when it is time. All of you who have left a comment on this blog, will also receive an e-mail on when the new site is up. This entry was posted on Wednesday, May 19th, 2010 at 11:03 pm and is filed under Knitting. You can follow any responses to this entry through the RSS 2.0 feed. Both comments and pings are currently closed. I hope all goes well with the transition to your new website. I will be doing the same, but not for a while. Once again, you are inspiring me! Can’t wait for the poppy posts–I have a feeling those will be amazing. Susan, moving to new site and standing on your own two feet definitely is a good feeling. Cannot wait to go out there and play with the DSLR, you know what I am talking about! The poppies are so delightful! I’m really looking forward to see where they end up. It’s a wonderful, generous idea and I hope you have a lot of fun with it. Me too, I am so curious where they will end up and who will find them. And so curious what the finder’s reaction will be… wonderment? Smiles? Endeared? Confused? Annoyed? Changing in any way? I will have fun, no matter what! Your poppies project is so uplifting and inspirational. I love it! I hope the finder will have the same reaction you have, Rachel! Hi Nancy, Love the poppies. One question — in groups of 3, that’s 33 to leave (gorilla street art!) around S.F. ; and one left over. What will you do with your stray poppy? I wish i could go on the hunt for these!! could you send them to my mailbox for me to find!?? Good to hear from you, Shawn! 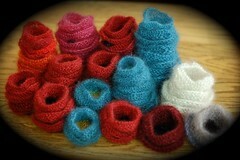 Aren’t they the cutest little knitted flowers?